The route takes you along pretty green tracks and paths where you can see loads of wildlife. It’s an undulating course but there’s plenty of nice scenery to keep your mind occupied. Start next to the visitors centre. Proceed past the wildlife pond and straight ahead towards the river. Cross the bridge over the river and climb the steps onto the dismantled railway line. Turn left and follow the path in the direction of Sturmer village. Immediately after passing beneath the old brick bridge, turn left up the steps onto the golf course. Follow the marked path across the golf course until you reach the road. Carefully cross over the road and onto the track opposite. 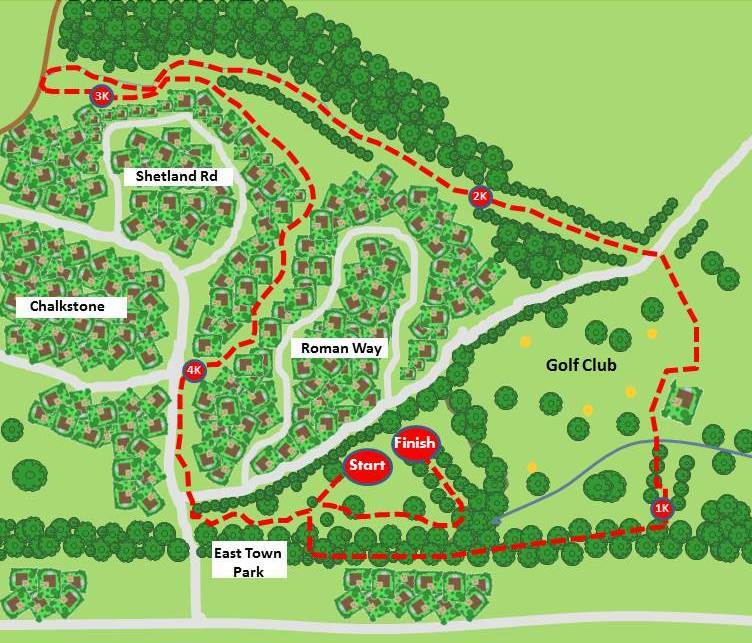 The track will lead you around the back of Roman Way and Shetland road, with the Wilsey Woods on your right-hand side. At the end of the track turn left and immediately left again onto the playing fields. Follow the marked route through the playing fields until you come out onto Chalkstone Way. Turn left onto the pavement and follow the road down the hill towards East Town Park. At the bottom of the hill carefully cross the road back into the park. Follow the marked path along the edge of the river before turning left onto the tree lined avenue. Finish the course at the top of the avenue. The route starts at the Leisure Centre and runs out along the railway walk to Howe Road, and then back again. It’s flat and fast, and is a great course to do if you want to test your fitness over a 5K run. The course begins in front of the plaza, next to the traffic lights. Follow the path past the cinema and the cricket club, down to the petrol station. Turn left into Manor Road and follow the pavement until you reach the junction with Railway walk. Turn left onto the railway walk and follow the path past the leisure centre and Tesco, and over the footbridge until you reach the end of the path where it joins Howe Road. Turn left immediately before the end and follow the grass path along the top of the bank which surrounds the small flood basin. Rejoin the railway walk and turn right back towards the leisure centre. Go past Tesco and the leisure centre, all the way back to Manor Road. Turn right down Manor Road and then right again back to the finish line at the Plaza. Old HRC Time Trial Route!